Data is eating the services industry! 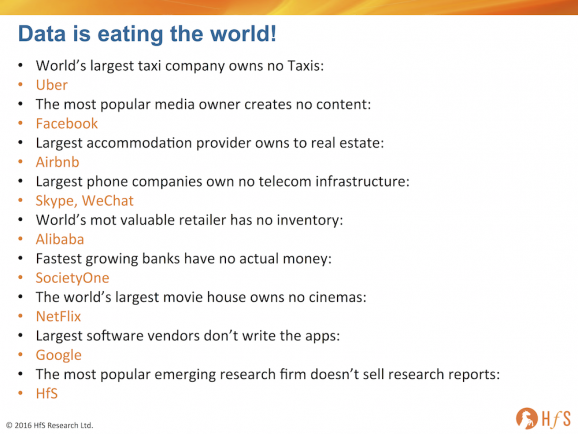 I was intrigued by Drupal's creator (the open source content platform upon which HfS is built), Dries Buytaert's, claim that "Data is Eating the World", a contrarian viewpoint to Marc Andreessen's famous 2011 quote that "Software is Eating the World". Yes, HfS makes the list because we extract data from thousands of enterprises and create a service to empower them to make decisions and stay informed - in real-time. We do not need to invest fortunes in collecting that data. We merely are the orchestrator of the world's largest community of service buyers and use digital tools and smart analysts to empower and inform our clients. We do not need physical offices in every major country, or armies of sales people to drive business. We let the community come to us and we facilitate the research data collection to reach our global participants. And it's the same in all of these other markets - the legacy (former) incumbents can see exactly what is going on. But sadly - for many - it is already too late to disrupt their revenues and survive. The sad truth here is that if you already know you've been disrupted, it's probably too late. A similar disruptive trend is occurring with regards to service delivery. Gone are the days when owning proprietary technology - and global capacity - was king. Yes, there are certain discrete segments in which owning software tools provides real competitive advantage (such as procurement and supply chain), so some providers can still steal a march on their competitors. But as more and more software apps become increasingly accessible and industry-standard, the value shifts to the quality of data and business services providers can offer to optimize the software platform, as opposed to providing the software itself. Today, software is the commodity - any service provider can slam in a Salesforce, a Workday, a Sage, a Blackline, a SmartStream, etc. The value the service provider needs to build is in the data model templates that can be standardized across multiple clients, tweaked when needed and delivered by service talent that understands the data to really empower their clients. Owning vast software and infrastructure resources is becoming secondary to being the orchestrator of core enterprise systems-of-record data. Today, we are seeing several exciting niche as-a-service providers spring up where automation is already native to their environment, where they do not need the massive people scale of yesteryear to deliver processes which should be standardized and much better automated today. The more ambitious clients focus on outcomes with their partners, the more the onus will turn to the quality of data being managed and analyzed, and the winning providers will be those who can do this using much smarter technology and people capability - at much lower cost to the customer. And being able to orchestrate the delivery across multiple clients creates powerful process data templates that are much more "plug and play" for clients than in the past. 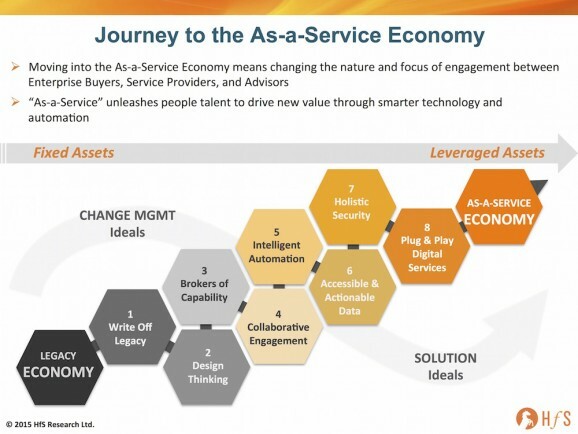 This isn't new, but it's really evolving, and the availability of better tools and robotic automation, coupled with the advent of cognitive computing and advanced analytics, are the accelerants for providers to become true orchestrators of their clients' collective experiences and best practices, as opposed to owners of proprietary applications and legacy lock-in systems. I'm personally excited by the advent of these As-a-Service providers. Facilitating and empowering the core data of the enterprise is where the real value is. This is the "lock-in" of the future: not holding clients hostage to software licenses, but instead holding them ransom to the value of the data you are enriching for them.